Now there's no excuse for employers not to let their staff work remotely if their roles allow this as reliability, accountability and creativity don't depend on your office location. As explained by a 'seasoned' digital nomad. My office on a small island in Indonesia. Breakfast included! Almost two years ago, I traded in my corporate life for a nomadic existence. Traveling the world, whilst freelancing. Or rather; freelancing whilst traveling the world. The opinions of people around me varied from congratulating me on my ‘brave move’ to doubting whether I would find (and keep) work. Whatever your opinion; I have tested the waters and have listed my top experiences below. Reliability depends on the person, not their location. I work wherever there’s wifi. And I make sure I am located in a place where I’ve got a reliable internet connection when I need it. I turn up for my meetings on time, just like when I used to work in an office. I deliver according to agreed deadlines. During business hours, but often also outside of those hours, I am available via Skype, Google Hangouts, WhatsApp and email. The only difference is that my ‘office’ happens to be in a room in a foreign city, a quiet corner in a library or sometimes (when I am lucky enough!) at a beach front cafe. My point is, I am still available, which is all that matters. Moving around a lot, not being confined to one working space gives me inspiration. My way of life gives me the opportunity to speak to many different people, experience new cultures and introduces me to new ways of thinking. Being exposed to this ‘thinking outside the box’ on a frequent basis allows me to be more creative, which in turn reflects on the work I deliver. Making valuable connections is one of the greatest advantages of being a digital nomad. I have attended numerous networking events in South America, Europe and South East Asia so far, both professional as well as casual meetings. Learning from others and getting an understanding how things are done in others countries is hugely beneficial. Moreover, my professional network has grown a lot and I can tap into those resources for advice, inspiration and assistance. I’ve emerged myself in all sorts of workshops, organized by co-working hubs I’ve visited around the world, and gave some talks myself at some of these places. The world is my office and I can choose to work any time of day. Don’t worry, I am not on a holiday. Just because I choose to explore new countries during my time off, doesn’t mean I am not working when I am in a different location. In fact, I could be working around the clock, and at times I find myself working at midnight, just because I can. Or there may be a time difference, meaning that I work while you sleep, and have something delivered the next day when you wake up. 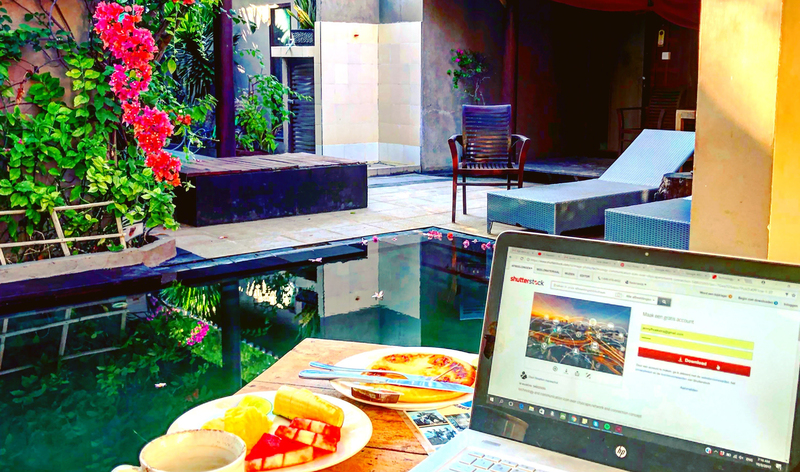 These are just some experiences from a very happy digital nomad. I am well aware of the fact that without companies willing to work in a less conventional way, I would not be able to pursue such a lifestyle. I therefore hugely appreciate all those people out there willing to change the way we work and who understand that we can network, connect, create and deliver even when we’re physically far apart.